Server Supervisor is a server, application and network monitoring application software that can be used by system or network administrators to monitor the performance, uptime and availability of various network resources. Server Supervisor applies resource-specific approach to monitor support devices, which range from local workstations to web and database servers with distributed architecture. When monitoring, Server Supervisor cecks the status of all resource components in a manner that depends on the resource type and monitoring parameters specified by the administrator. Monitoring of local and remote network resources. More than 20 monitor types to target specific resources. The following monitor types are available in the product: Ping, Connect, DNS, HTTP, HTTP Content, HTTP Transaction, IIS Status, Apache Status, Process execution, MySQL, MSSQL, Oracle, FTP, SMTP, POP3, IMAP, CPU usage, Free memory, Page file, Free disk space, Network usage, File system. Users can also create your own monitors to check any non-standard network services. Ability to perform actions upon problem detection such as send immediate notification by email, SMS or IM service, launch another application to resolve the problem, or run or stop antoher monitor or group of monitors. Email, SMS and IM (ICQ, Yahoo! Messenger and MSN Windows Live Messenger) notifications on faults. Resource uptime and summary reports with period and group selection. Thanks to Sergey Petrov from SoftLogica, the developer of Server Supervisor, to supply us with a license key, we manage to download and install Server Supervisor for a review. In fact, administrator or webmasters or anybody else download a free 25-day trial version of Server Supervisor (direct download link to serversupervisor.exe). The trial version is full feature without any limitation or restriction, allowing user to experience Server Supervisor completely in full after installation. Installation of Server Supervisor is a easy task. In fact, the installation of Server Supervisor has incorporated few settings that users need to setup, making Server Supervisor can be used instantly without any more configuration after installed. Such configuration setup includes whether to use secure SSL layer at port 443 to serve Server Supervisor web interface (if yes, with ability to generate a SSL certificate), and creation of user name and password to login to Server Supervisor. All management of monitored devices is done on Server Supervisor web interface. The web interface is straightforward, clean and easy to use. What a bit confusing, especially for people who has used other NMS (network monitoring system) is that Server Supervisor treats a server as “group”, and IP address, URL or location as “server”. Otherwise, adding in a server for monitoring, and adding component monitors for the server is a bliss process, although users have to create and add monitors to a node one-by-one, rather than applying some monitors to a resource in one go. Server Supervisor has an advantage that allows user to have a glance of all monitors’ performance statistics, by placing a graph icon at the back of the monitors. Want a bigger graph or customize the graph setting such as duration? Click on the “Details” to get it all, with more charts including uptime and distribution. And users can get details of each probe or poll by Server Supervisor too, useful for troubleshooting if there is an error while probing or polling the data. Server Supervisor can also monitor daemons or processes that running on a server. It supports SNMP (requires community string but no SNMPv3 support) or WMI (requires user name and password) to poll and retrieve OS resource data such as CPU usage, page file, free memory (memory consumption), free disk space and network usage (speed of data transfer via the TCP/IP protocol), other than process. For alerting, Server Supervisor supports email notification, instant messaging notification, SMS notification, starting or stopping other monitors (to suppress further error message from other monitors that may fail too), or custom action (run a command). Notification alert method is sufficient in most cases, but it will be useful if future version can add alert methods such as pop-up to screen, or sound an alarm. For report lovers, not much reports though, but it should be enough for basic need. 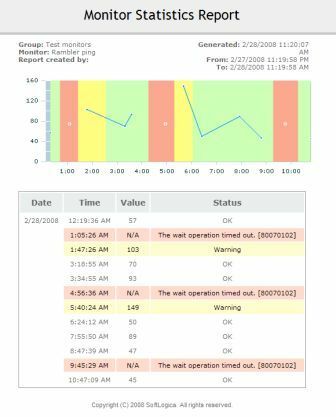 There is statistics, distribution and uptime reports for each and every monitor, or for group. Users can schedule the reports to be generated and sent by email automatically too. Users who have many nodes or devices will surely miss the mass import facility. Beside, Server Supervisor appears to be lacking feature to be used a network monitoring app for network devices, such as router, switche, firewalls, IPS, IDS, encryptor, and other devices from Cisco, 3Com, HP, HuaWei, Juniper, Nortel, TippingPoint and etc. It doesn’t have SNMP resources discovery ability, in fact its SNMP resources monitoring is severely limited by supported monitor types only, so users can’t monitor by interfaces or VLANs. And obviously, it also lacks the features to support custom MIBs, where users can use OID to monitor non-supported resource value, such as CPU fan speed and etc. And although it supports WMI and remote login (as in the case of MySQL monitoring), it doesn’t have ability to grab user experience performance counters such as delivery queue of Microsoft Exchange Server, requests per second or connection status of Internet Information Service (IIS) and Apache web server. Overall, Server Supervisor is useful for entry-level network server and application monitoring. It’ll be useful for webmaster who wants to monitor the web servers or web hosts on their own without relying on third-party monitoring service, or administrators who wants to monitor their application servers, or people who wants a cheap monitoring system, as other monitoring system may costs you thousands of dollars. Administrators from corporate may find the features on Server Supervisor insufficient, though we’re sure that it will be improved in future version, as the current version that we reviewed is just been released, at version 1.0 build 24. Server Supervisor can be installed any system running Windows 2000, XP, Server 2003, Vista, Server 2008 and configured over the network with help of web-interface. The regular license costs $200, which can monitor up to 20 objects or resources simultaneously. Further expansion for 20 monitors will costs $40 per monitor packs, which adds further 20 monitors usage. Visit http://www.serversupervisor.com/ for more information or to purchase and order a license. Disclaimer: This is a paid review.